Geranios Suites & Spa Hotel has everything you could want in the way of holiday accommodation. 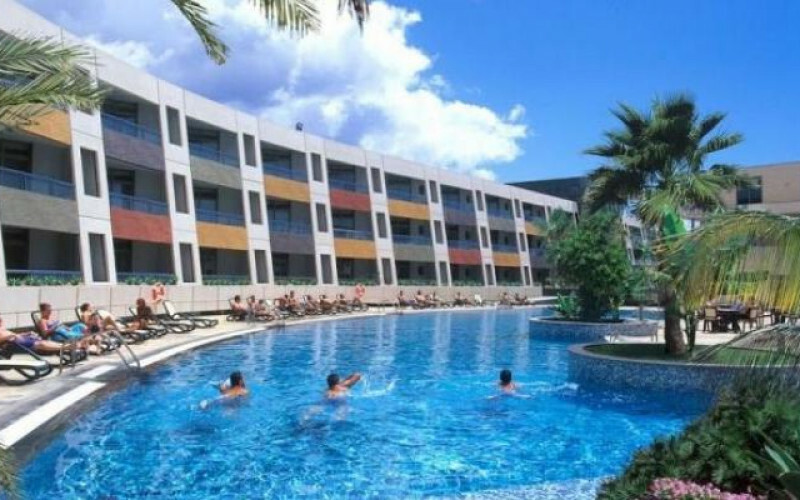 This is both a modern and stylish holiday complex that is located in the resort of Caleta de Fuste, and which has exceptional ocean views and its own private beach. It is the perfect place from which to explore the island of Fuerteventura and just 10-15 minutes away from Fuerteventura International Airport. Geranios Suites & Spa is ideal for families, couples and groups of friends. Not only is the hotel accommodation to a high standard it also boasts some excellent facilities, in fact pretty much everything you could wish for. There is a superb range of sports facilities where you can make use of tennis and squash courts along with a health club, gym, sauna and spa if you fancy a bit of pampering. The children can make new friends at the on-site kids club whilst you are relaxing. You can take your choice of swimming pools as there are three available, one indoors which is part of the Spa, and two outdoor pools including a children's swimming pool. Geranios Suites & Spa Hotel has a large range of accommodation options and you are sure to find something that suits your expectations as well as your pocket. This 5 star hotel has 223 rooms which come in the form of suites and villas. The suites and villas all come with air conditioning, satellite TV, safe, Wi-Fi, microwave and bathroom with a shower and/or a bath. The Junior Suites have two large beds with separate living area, bathroom, kitchenette and balcony. The villas have two bedrooms, bathroom, living room and kitchen, as well as their own private pool and terrace. Some of the Superior Suites and the Villas are suitable for disabled access and baby cots are available on request.